Click here to download Princess Model Girls Tower Fantasy Today! Every princess model girl deserves a castle. But since no one is of help, it's up to her to build it. It's surely not easy to do so. Especially when there are so many other models who also have the idea of building their own castle on their mind. A fierce competition is under way in a world that lacks real pink castles...and desperately needs its champion princess. Will you be able to construct the ultimate castle and deserve your title as the Best Princess Model Girl Player? Are you ready to battle with thousands of other princesses who are ready for heated competition? It's time to show the world what you are capable of. Grab the hasty little green dragon Gazo as a sidekick and start your castle building adventure. 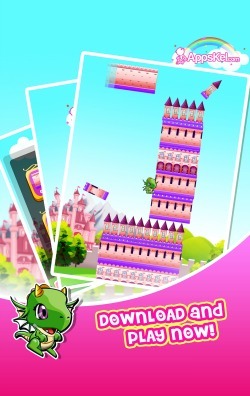 Princess Model Girls Tower Fantasy is a dynamic game which lets you construct your own pink castle and compete with other players all over the world. 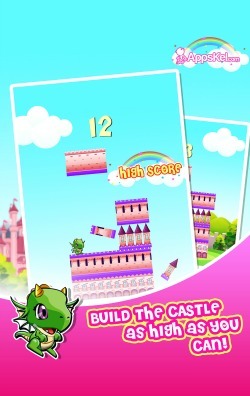 The objective is to build the Tallest Pink Castle there is by laying blocks upon blocks. You have to be careful, because if you don't place a block well, it will chip and reduce your chances of staying on top of the leaderboards. 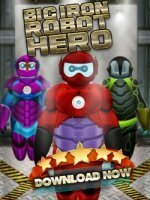 Experience an intensive, fun and engaging builder game that will keep you on the edge at all times. While Princess Model Girls Tower Fantasy is free in the AppStore, you can buy a paid version to remove the in-game ads or apply paid upgrades in order to increase your chances of becoming the champion princess. 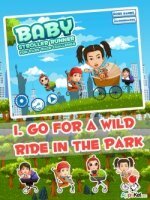 The game has global leaderboards which let you compare your score with the scores of other gamers around the world. You can always share your highscore on social media (Facebook and Twitter) or by email to let your friends know about your proud achievements. Basically, Princess Model Girls Tower is a block-based game. You start with the foundation of the castle and each few seconds a new block (castle floor) comes from a random side. You need to place the oncoming blocks upon the previous ones in order to build the perfect castle. Perfect fit placed blocks are the best way to ensure your castle will be the tallest one, but lining them correctly is not so easy. Every time you misplace a block, a part of it which has not fitted correctly will chip away. When this happens, the next oncoming blocks will be the size of the chipped away block. With the possibility of blocks getting smaller and smaller, you have to be careful with your placement! When you reach the moment where a block is only one square wide, the game is over and your final score is shown on the screen. 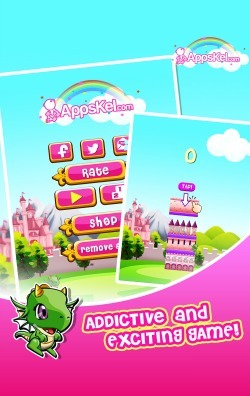 Princess Model Girls Tower Fantasy is free in the AppStore. However, you can purchase a paid version ($1.99) of the game and have in-game ads removed. There are two additional upgrades for $1.99 each – one of them features slower block movement speed (Slowmotion) while the other increases the block width (Extra Wide).